Two convenient ways to make deposits into your account at the credit union are via direct deposit or payroll deduction. 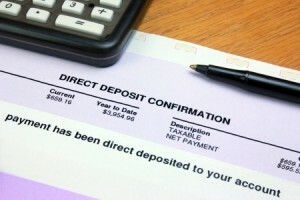 You must be a member (have a savings account) at the credit union in order to have payroll deduction or direct deposit. To join ICU, please complete the Membership Application (membership eligibility required). Talk to your employer about direct deposit convenience at ICU! Direct Deposit is the term used when your entire paycheck is deposited automatically to your ICU account. Direct Deposit may be set up for recurring payments, such as your paycheck or social security check or one-time payments such as your tax refund or expense reimbursement. Payroll Deduction is the term used when only a portion of your paycheck is deposited automatically. Payroll deduction may be used to make loan payments, make regular savings deposits or checking deposits. ICU also offers direct payment options, where you can direct the credit union to take a specified amount out of your checking account each month to make a loan payment or savings deposit at another business or financial institution. We do payments twice a month, on the first and fifteenth. With any of our automatic payment options, you may cancel or change them at any time. If you are interested in payroll deduction or direct deposit, contact your employer to see if they offer this benefit to their employees. If your employer does not offer this benefit, please contact the credit union at 715-635-8273 or 1-800-645-9391, and ask to speak to Accounting, we will contact your employer to try to set up this benefit.